Jim, a friend of mine that lives in Oceanside, has done several reviews of restaurants with me in the past. For the past month or so we have tried to get together but something has always happened to thwart our plans. This evening we were successful and went to Fiddler’s Green, near the entrance to Shelter Island in Point Loma. It has been many years since I have been to the Fiddler’s Green. It used to be a favorite place of my deceased husband because the owner liked to fish and he and Bob exchanged “fish tales” for many minutes. Since they are not open for lunch Jim and I decided to try the restaurant at its opening of 5:00pm. I had remembered that they had an early bird special – which they still have – as long as you ordered before 6:00pm. Our waiter, Tom, immediately brought us warm, succulent rolls with a small cup of butter. Although there were two of us, we were brought three rolls – two sour dough and one pumpernickel. I offered to share the pumpernickel with Jim, but he preferred to have the sour dough rolls, and we both enjoyed our respective bread. When Jim asked Tom for more rolls a little later on, he brought us four rolls, two of each. Tom then asked for our drink order and Jim had draft beer while I had a frozen margarita. He enjoyed his beer, but I would have liked a little more tequila in my drink. As we talked to Tom, who looked very familiar to me, we found out that he lives in Ocean Beach – he jogs along Sunset Cliffs daily, and frequently waves to Buddy and me on our walks. He has been at the restaurant for over 12 years! We asked Tom about the Early Bird Special and he checked to make sure it was not 6:00. 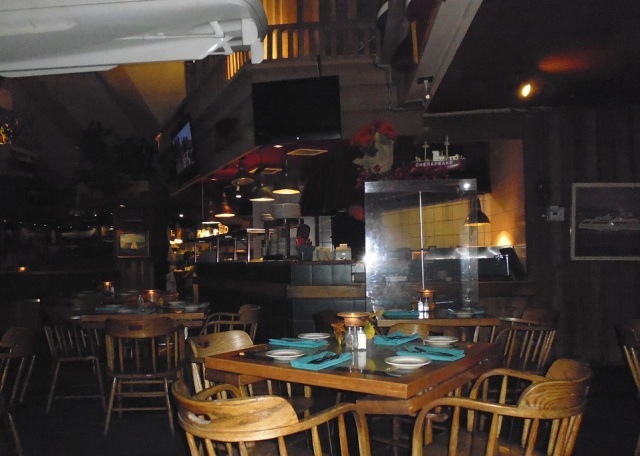 There were two specials – swordfish for $18.95 and a 9 ounce serving of prime rib for $19.95. 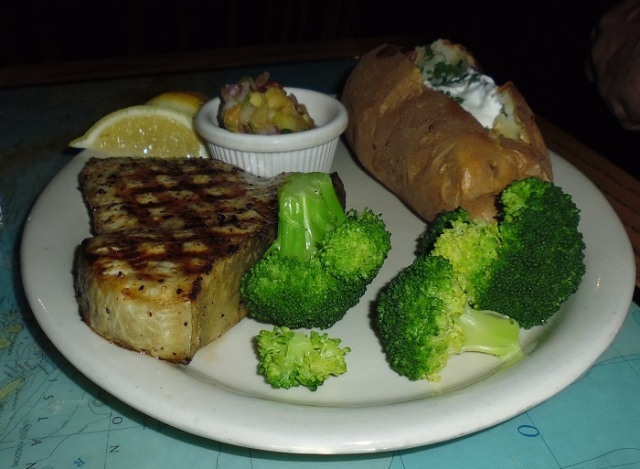 Also offered was the fish of the day – mahi mahi. 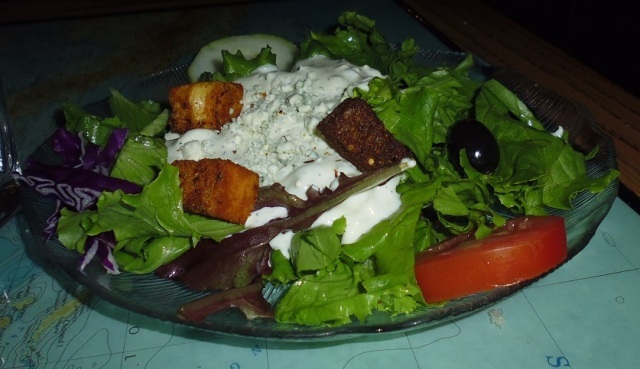 These entrees came with soup or salad – I had clam chowder and Jim had the salad. Other choices included baked potato, rice pilaf, or garlic mashed potatoes, and the vegetable of the day, which happened to be broccoli. Jim had the swordfish and I had the prime rib. The Early Bird Special was not on the menu nor on the table, and I presume unless you ask for it it is not offered. The regular menu has a nice selection of appetizers, salads and soup, pasta, and the entrees include meat and chicken, Fiddler’s seafood, and fresh catch of the day. The wine list has many listed, and there are seven draft beers available as well as eight domestic beers and three imports. Although we did not see a dessert menu, Tom told us, twice, what the desserts were and I could have ordered one of each because they were so tempting. There was mud pie, crème brulee among those he mentioned. Both the mud pie and crème brulee are two of my favorite desserts. We showed great restraint and did not order any. Jim said the swordfish was cooked to perfection. It was very moist, and large. The accompanying potato and broccoli added to the senses, both by aroma and sight. 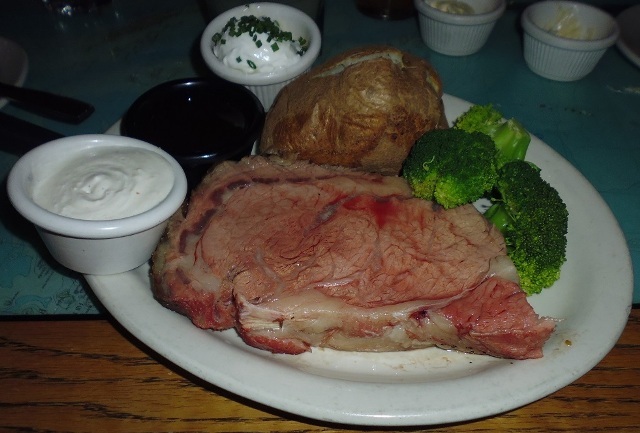 The prime rib was cooked just the way I ordered it – medium rare. It, too, was tasty and the creamed horseradish added to the flavor. It was also appealing to the senses. We spent some time talking to Tom while he waited on the many tables around us. He was very knowledgeable of the décor – and we could have listened to him for hours. The restaurant itself had great ambiance, and, in spite of televisions around the room, the sound was not on and it was not intrusive. The total bill, including our tip was $72. There were two glasses of beer; one margarita; and the two entrees. On the way out we met the owner – Steve – and told him how much we enjoyed our meal. Yes, we told him we would go back again and he thanked us for our patronage. I suggest you go before 6:00pm to take advantage of their pricing, but any time would complete your wonderful day.